Former Manchester United player Pat McGibbon has opened up about how getting sent off on his debut made him a more resilient player and taught him many lessons. 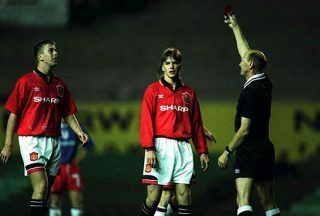 McGibbon joined United in 1992 and played in the Reserves team before making his first team debut against York City in 1995 when he was sent off. He spent two loan spells at Swansea and Wigan, before joining the Latics on a permanent basis in search of regular first-team football. The defender made over 150 appearances for Wigan before leaving in 2002. McGibbon appeared on the Mike Clegg Youtube channel recently and he talked about how it felt to have been sent off on his debut against the Minstermen. He also gave an insight into how it helped him improve as a player. He said: “When I was sent off, the Man United supporters were really good. Inside the dressing room, the gaffer did have a few words to say. “When I came down the next morning, he (Sir Alex) called me at his office and had encouraging words. The really good thing about that time is that after the warm down and there used to be a group of lads, they were just making a joke of it! The defender made seven appearances for the senior Northern Ireland national team and has also managed four clubs in Northern Ireland.